Teddy in a Bag – Page 2 – Every bag has a Teddy, because everyone likes Teddies! Every bag has a Teddy, because everyone likes Teddies! 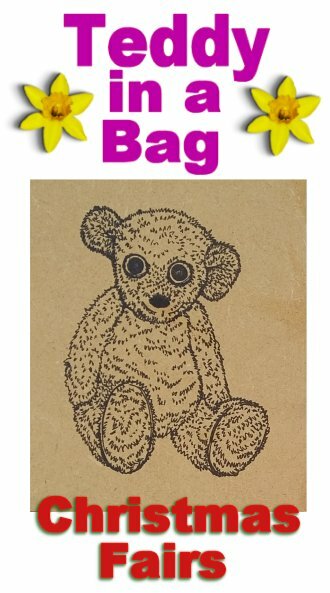 Everyone loves teddies and what could be better than a shopping bag in teddy print with a teddy in the front pocket! This pretty cotton shopper is ideal for a child to carry lots of toys inside, or if they go to school, it will carry their boooks, or be a roomy lunch bag. The bag is sewn with double-cotton fabric. On the outside is a cute teddy print and on the inside is a pretty daisy print to match. The daisy print is carried forward into the trimming, handles and long pocket both sides (which is roomy enough for several pencils or coloured pens or more!). And of course a really nice bonus is the small teddy sitting in the front pocket. You can see the teddy outside the bag as well. It is a little plush teddy with jointed arms and legs so that it can sit as well as stand. Bag measures approximately 8.75 inches (22.5 cms) in height (not counting handles) and is 10.75 inches (27.5 cms) wide. The two handles measure 8 inches (20 cms) [3.5 inches actual carrying depth] each one. The tiny teddy is 3 inches (7.5 cms) tall. Although the teddy has a CE mark, I would not recommend leaving the teddy in the bag when giving to children under 3 years old to play with unsupervised, owing to small parts. This roomy bag is for teddy lovers and it is an ideal present for both girls and boys. Price of each bag with teddy is £8.00 each at Fairs and Markets and is £11.50 (which includes careful packaging, postage and processing) on the Elephant Sun Dog Etsy Shop. I hope you love our teddy shopping bags as much as we do! Posted on November 19, 2018 November 10, 2018 by Silvi VealePosted in Childs Cotton Shoppers, Christmas Fairs, Cotton Bags, Teddy in a bag, Tote BagsTagged child's shopper, Children's bags, childs tote, cotton, medium bags, Teddy Bags, tiny teddy. Here are two new small pink baskets with teddies inside. I try to make a range of colours for these dear little baskets and so I have just added a new shade of pink called ‘candyfloss’, alongside the pale rose pink. Together with this new colour, we have rose pink and baby pink, as well as baby blue and dark rose sparkle and cream. You can see some of the other colour baskets here. But I thought I would show off the new candy floss colour basket (with small teddy with matching scarf of course 🙂 ), and soon to follow will be some new blue shades and maybe lilacs too. These little baskets are ideal for small hands to carry and they each contain a 5 inch teddy with room to spare. They are among our most popular little teddy bags. These little baskets with teddy in a scarf are priced at £4.00 each at markets and fairs. If I get the time I will put a few online as well, but they will cost a little more, owing to postage and packing charges. Here is another of the cotton tote bags which are very popular at our markets. This one is in a lovely elephant print (with very cute elephants 🙂 ) and the trim and reversible lining is a beautiful, bright star print. Of course, each elephant print tote has a tiny teddy in the pocket. Cotton tote bags measure approximately 9 inches in length (not counting the shoulder strap) by 7.5 inches wide, and the tiny teddy is approximately 3 inches high when standing. As the tiny teddy is quite small, although the teddy has a cE mark, for safety I recommend that the teddy is not given to under threes to play with unsupervised. These little bags are priced at £6.50 at Christmas markets or at £9.00 (includes postage, packing and processing costs) when available in our Etsy shop. Children love them and the bags are so useful too! Posted on November 17, 2018 November 10, 2018 by Silvi VealePosted in Christmas Fairs, Cotton Bags, Shoulder Bags, Teddy in a bag, Tote BagsTagged Children's bags, childs tote, cotton, elephants, Shoulder Bags, Teddy Bags, tiny teddy. The tiniest teddies you are likely to see this Christmas! These micro teddies have an average height of 3.5 cms (1.5 inches! ), so they really are micro tiny! They are available at fairs and markets only. They come in a range of colours (and some are patchwork too) and a range of pretty gift bags. Even though they are so, so tiny, these micro teddies still have jointed arms and legs, so you can move them around. These are not suitable for small children, owing to their micro size, but for anyone over three, they make a lovely little gift for the Christmas tree or to slip inside a Christmas stocking as a surprise. My little micro teddies in gift bags are priced at £1.00 each, so they make great pocket money toys for the over threes too! Posted on November 16, 2018 November 12, 2018 by Silvi VealePosted in Gift Sacks, Teddy in a bagTagged Christmas Fayres, Gift Sacks, micro teddies, stocking fillers, tiny teddy. Another brand new backpack! This one is in a lovely shade of lilac with a silky lining inside the bag and in the front pocket. And of course it comes with a small teddy snuggled down in the roomy front pocket. This is one of a range of backpacks you will see at our Christmas fairs and markets. I have them in lilac, baby blue, pink and Christmas red and cream. Because they are handmade crochet items, backpacks do vary in size a little, but this one is pretty average and measures 9.5 inches in length and 7.5 inches in width (and will stretch a little more when filled). Shoulder straps are each 14 inches long but will stretch a little to fit a child’s shoulders. All backpacks are lined – inside the bag and in the front pocket. And not forgetting the teddy. Teddies in backpacks are all 5 inch teddies with moveable arms and legs, so they can sit as well as stand (and lie down 🙂 ). Medium backpacks like this are suitable for most children. They are priced at £8.00 at fairs and markets. When posted to our Elephant Sun Dog Etsy Shop, they will cost £8.00 plus postage and packing and processing. I hope you like this lovely lilac backpack. It’s a lovely, roomy little bag and with the teddy and just right for a lovely gift! Posted on November 15, 2018 November 10, 2018 by Silvi VealePosted in Backpacks, Shoulder Bags, Teddy in a bagTagged all ages, backpack, Children's bags, Crochet Bags, medium bags, Older Children's Bags, Shoulder Bags, small teddy, Teddy Bags. When I made my post about the Pretty Peach Cradle Bag with Teddy, you may have noticed a pink cradle bag in the last picture. Well here it is. I couldn’t leave out the pink and cream version of this lovely small bag. Here is the cradle on its own (as you can see, it can be used for any soft toy or doll of around 5 inches in length). And here it is with the teddy which will be inside. As always, the small teddy inside is wrapped in its own crochet blanket and turn the covers out and up and you have a dear little drawstring bag. Prices for all the cradle bags with a small teddy inside are £7.00 each when purchased at Fairs or Markets (but the cost of postage and processing fees will be added when purchased from Etsy). These are definitely a lovely present for a child who wants a gift to treasure! Posted on November 14, 2018 November 8, 2018 by Silvi VealePosted in Cradle Bags, Little Bags, Teddy in a bagTagged all ages, Children's bags, Cradle Bags, small bags, small teddy, Teddy Bags. See Teddy In A Bag This Coming Saturday! See Teddy in a Bag at The Salvation Army Christmas Fayre in Southsea on Saturday 17th November, 2018. The Salvation Army Christmas Fayre is from 10.30am to 12.30pm in the Lighthouse Community Rooms, Albert Road, Southsea, this coming Saturday 17th November. There will be lots of interesting stalls, with Christmas gifts and more! The lighthouse cafe is open and the Fayre will be opened by The Ugly Sisters, who are appearing in Cinderella at the Groundlings Theatre. Please come along and enjoy making a great start to Christmas this year. Posted on November 13, 2018 November 16, 2018 by Silvi VealePosted in Christmas Fairs, Teddy in a bagTagged all ages, Children's bags, Christmas Fayres, Crochet Bags, Gift Sacks, stocking fillers, Teddy Bags. Elephant Sun Dog Etsy Store!